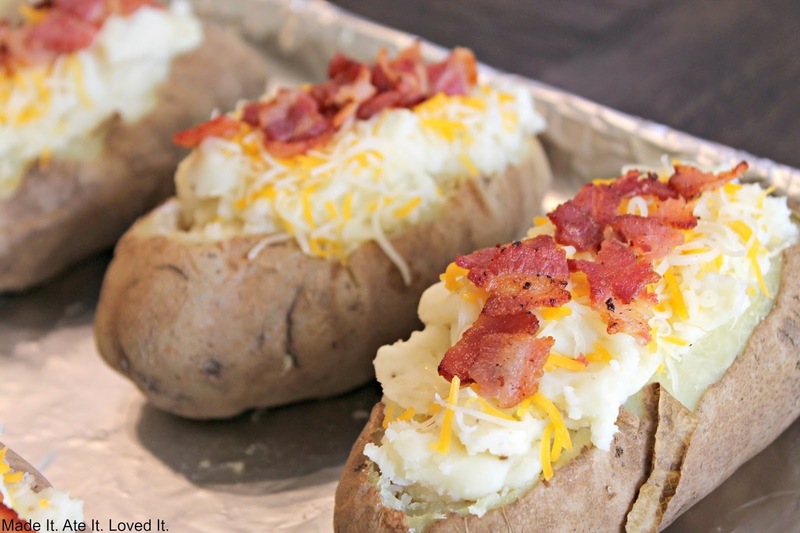 Twice Baked Potatoes - Made It. Ate It. Loved It. 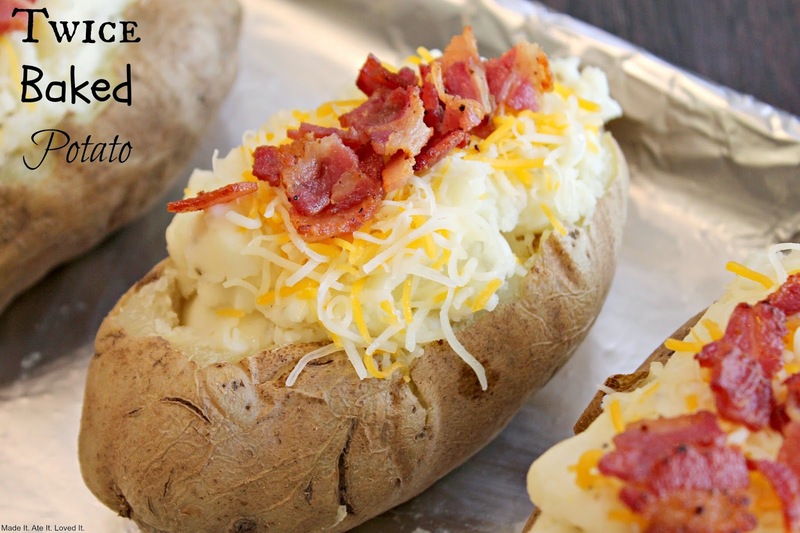 Twice baked potatoes are one of my families favorite sides. My oldest son has become a huge fan of potatoes and baked potatoes lately. And these are his favorite way to eat them. Well actually more like these with a huge dollop of sour cream on top! I don’t blame him sour cream is yummy! I don’t usually add the extra sour cream ( I don’t think they need them) but if you are a sour cream lover go ahead! 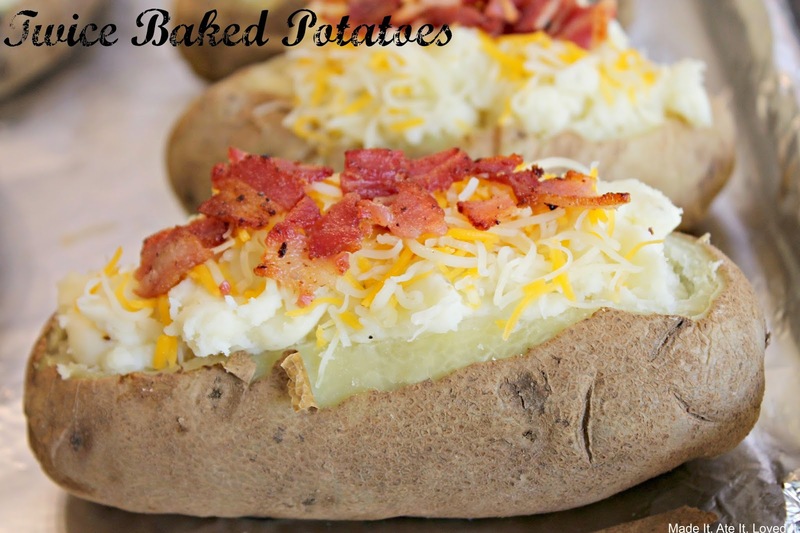 So next time you have extra potatoes lying around or need a side dish try jazzing the good ol baked potato up and making these! You won’t regret it! Preheat oven to 350 degrees and cook potatoes for 1 hour. (You can always microwave if you don’t have a hour to cook) When potatoes are done let them cool for about 10-15 minutes and then slice the potatoes in half or if you don’t need that many you can just cut the tops off and make less bigger potatoes. Grab a mixing bowl and then scrape out the inside of the potatoes. Once the potatoes are all scraped out (still leave the sides in tact and a little bit of potato still on it) take the insides of it and mix together with the sour cream, cream cheese, whole milk, butter, salt and pepper, and shredded cheese. Combine together. Add more or less milk depending on the consistency of the mixed potatoes. This will depend on how big your potatoes are or how much you scrap out of the cooked potatoes. Once it is all mixed together grab the potato skins and stuff them with the potato mixture. Top with a little shredded cheese and crumbled bacon. Bake at 350 degrees for 15 minutes. The cheese should be melted but not crunchy! So watch them!